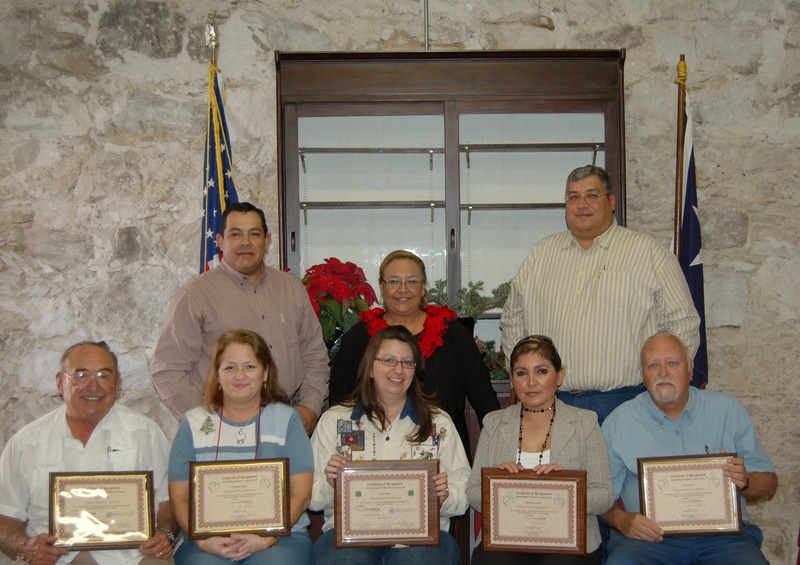 Texas AgriLife Extension Service honored their outstanding volunteers at a luncheon on December 15th at the Tijerina Complex Rio Grande City. Under the area of Agriculture and Natural Resources Andres Canales and Fausto Salinas were recognized for their support and involvement in such programs as the Rio Grande Valley heifer pen show, conducting pesticide certification trainings, Risk management and actively serve on task forces, committees and the Leadership Advisory Board which oversees the overall Extension programming in Starr county. Mr. Jim Seeden and Elizabeth Margo were recognized for their work in Community Development in working with students on Water Conservation programs. Mr. Seeden has conducted student tours at Rancho Las Lomita’s with Mr. Benito Trevino where students learned about the benefits of utilizing Rain Water Harvesting projects. Mrs. Elizabeth Margo waged a pledge campaign at her school during National Fix A Leak Campaign in the spring of 2010 and reached over 300 students and their parents. In the area of Family and Consumer Science, Emiliana Guerra was recognized for her role as a Diabetes Task force member and for having been an instructor in the Spanish diabetes curriculum that was pilot tested in Starr County. The results were so significant that the program/curriculum will be distributed state wide. A total of 92 participants were recruited at 4 sites and 87 completed the series. The other two not pictured are Mrs. Gloria Villarreal from Teaching and Mentoring Communities for their agency’s support to providing training opportunities to child care providers and parents. This year parent’s of young children learned about the importance of exercise, nutrition, fathering and how to deal with hard financial times. In the area of Youth Development Laura Rocha was recognized for her work in 4H reaching out to not only 4H’ers but all youth from throughout the county. She along with her committee organized the Kids Fish project which provides a valuable outdoor fishing experience for Starr county youngsters. She secures the support of various agencies, sponsors, donors, and volunteers to conduct the annual event. Over 1,200 adults and youngsters have participated in the last 2 years. She is also the club manager for the Vaquero 4H Club which has 4H’ers participating in multiple projects which include foods & nutrition, clothing, food challenge, animal projects for the fair, local parades, food drives and other community service projects. Volunteers are an important part of Extension. In Texas Extension trains and oversees a corps of volunteers, whose annual service to Texas represents the equivalent of a full time workforce of 2,140 (valued at $84 million) more then doubling or agency’s human capital. The Extension Volunteers are the pride of the organization and play a significant role in promoting quality of life for Starr County residents.